My Barbara Bush story: When my kids were little, I would dress them especially well for children’s story hour whenever I saw “Celebrity Guest Reader” at Graves Public Memorial Library in Kennebunkport. It was the 1990’s, my husband worked long days at the Shawmut Inn on Ocean Ave (remember it?) before starting our marketing company (IMS-21), so I treasured our outings to the library. I loved sitting on the floor with my kids, listening to Barbara Bush read to them – the kids thought she was a nice lady, “she’s funny.” I explained to them what a privilege this was, being in the presence of our First Lady, wife of our 41st President – but that didn’t matter to my kids. She loved to read, and they loved to listen to her. One visit she brought her dog Millie – that was a hit. 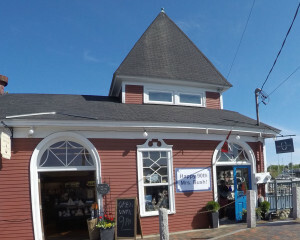 See Barbara Bush’s favorite places in Kennebunkport, and how our town memorialized and rememberd her in April 2018. I also remember a charity fundraiser at The Nonantum, Barbara Bush arrived through the back door in Keds, slacks and her classic pearls – when she spotted my husband and me dressed in a tux and gown she was not too pleased. But she had us laughing in minutes as she said “those protocal people don’t always get it right.” She stayed for drinks and dinner, just to surprise the Nonantum staff and those damned protocal people. Proof: the best dress code is humor and a smile (with pearls of course). Flash forward from the 1990’s – our fabulous First Lady turned 90 in 2015. 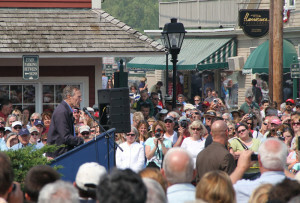 President George H. W. Bush (41) turned 90 the previous June in Kennebunkport by parachuting from a plane. Barbara Bush’s 90th plans were a bit more tame and literate, literally. June 8, Kennebunkport booked her a bash – a tribute to the joy of reading benefiting the Barbara Bush Foundation for Family Literacy which is celebrating 25 years. 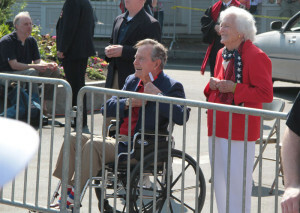 Barbara Bush’s Birthday Party event in Kennebunkport was private and pricey (but all proceeds benefit her charity). Among the highlights, the Bush family, friends and donors gathered under a big tent at St Ann’s Church to enjoy the musical talent of Amy Grant, Reba McIntyre and Michael W Smith. The Ogunquit Playhouse hosted top authors for a Celebration of Reading the night prior to her 90th. 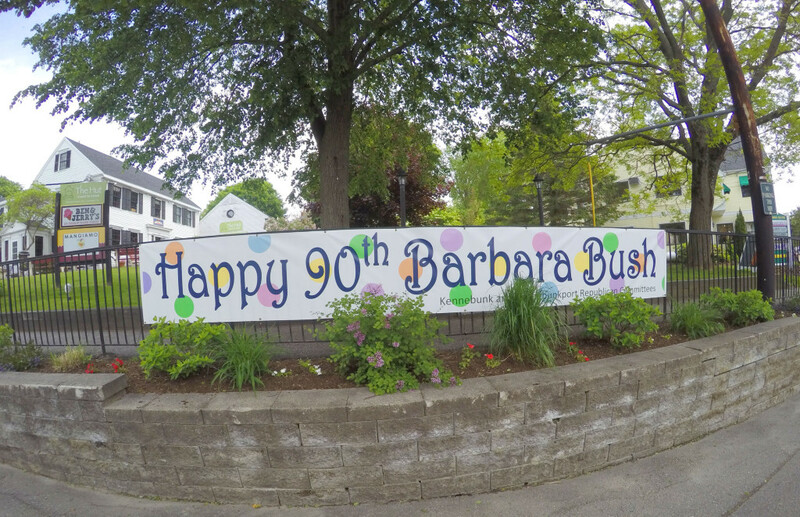 As you drive through Kennebunkport’s Dock Square you’d see signs wishing Barbara Bush a Happy 90th. She was indeed our First Lady of Kennebunkport, kind, generous, funny, strong, and committed to literacy. My kids now recognize how special those “celebrity guest” children’s story hours were. Also having a past President at their Memorial Day Parades when they were in the Kennebunk marching band was “pretty cool.” We wished Barbara Bush a very happy 90th and good health and happiness to the Bush family. 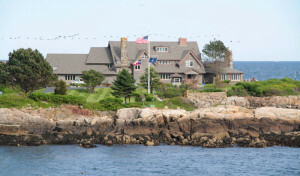 We remember our First lady Barbara Bush of Kennebunkport well here… her favorite places where her spirit lives on. Tickets to former First Lady Barbara Bush’s 90th birthday dinner celebration – $5,000. By donating $5,000 to $9,999 donors are also invited to Sunday’s “casual evening of authors and special guests” at the Ogunquit Playhouse. The “friend” of Barbara Bush level is $10,000 to $24,999, donors receive a second invitation to each event. Silver level of $50,000 to $99,999 includes two tickets to the dinner and “casual evening,” and the Cape Arundel Golf event. Gold donors, $100,000 -$249,000, receive six invitations to the Dinner, two VIP reception tickets to Walker’s Point, and six invitations to the Ogunquit Playhouse event. 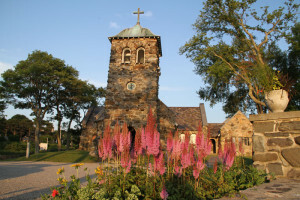 If you are in Kennebunkport this summer, you should visit the First Family Legacy Museum at White Columns, and definitely stroll through Ganny’s Garden on the River Green in front of the Captain Lord Mansion.